For 15 years already, EDF EN Italia has been active in the renewable energy market. The Italian company, with its headquarter in Rome, belongs to the EDF group and is one of the leading energy utilities in Italy. Being focused on wind energy first, EDF EN Italia started to expand its portfolio with photovoltaic power plants back in 2007. 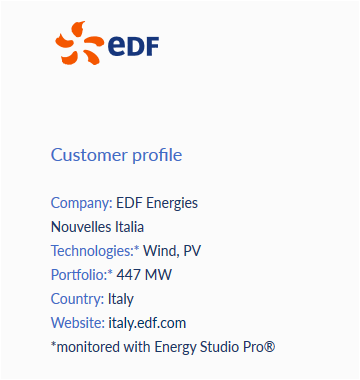 Since then, EDF EN Italia has been extending its photovoltaic sector enormously and is now improving the operations of its 59 photovoltaic power plants and 7 wind farms with Energy Studio Pro®, having a total installed capacity of 447 Megawatts across Italy, including Sardinia Island. The introduction of photovoltaic in 2007 and the growing number of various manufacturers led to numerous applications to be handled. But after all, it is very important to be able to go into fine details, even of big installations, in order to detect failures and optimize production explains Emilia Visconti, Chief Technical Officer at EDF EN Italia. That is why EDF EN Italia saw a big advantage in reducing the amount of work and downtimes with a unique solution that allows to go deep inside power plants to ensure that costs are under control. Thus, EDF EN Italia began looking for a reliable partner to work with. We heard about BaxEnergy and Energy Studio Pro® from our colleagues at EDF EN Portugal, who were already using the system for their wind farms and the feedback was very positive says Emilia Visconti, who points out that a very good cooperation started after contacting BaxEnergy in 2012. EDF EN Italia and BaxEnergy jointly defined how Energy Studio Pro® could be adapted to its individual needs. Energy Studio Pro® was implemented in the monitoring room in Rome, where operators benefit, among other advantages, from long-term data archiving and predictive analysis. remarks Emilia Visconti. Today, the system calculates important KPI automatically and enables its operators to easily compare the performance of single generation units or whole power plants with a simple drag&drop gesture. Energy Studio Pro® allows us by far to dig deeper into our assets so that we can pinpoint and solve issues much faster highlights Emilia Visconti and moves on: With the system, we can now manage our assets proactively. Since the company uses BaxEnergy’s solution, EDF EN Italia has been constantly expanding its knowledge base. In the near future, EDF EN Italia is planning to integrate another wind farm into Energy Studio Pro® and is looking forward to further intensifying its strong collaboration with BaxEnergy.